If you want to be the dealer, and if you want to take the gambling game under your control, our chip tray barcode cards viewer are the best choice for you. In interior of the chip tray, we installed a barcode poker cards viewer. The most important thing is that you, not to speak of other players even can not see the barcode poker viewer. The side facing to players is a processed board, and the cheating cards viewer can see through the board and scanning the barcode marks that hidden on the edge of the playing deck. And because the chip tray is sealed, so it is rechargeable batteries. And you no need to worry about the charging port, because it just like a pinhole, on one can see and notice it. After the chip tray side marked cheating playing cards viewer scan the barcode marks, the signs receiver in the poker analyzer system will obtain the scanning picture and analyze it, then, only take 1 second, you will be informed that who the winners are. By the way, you no need to be anxious about adding player, because you have a controller to add and reduce the numbers of the players. In a casino, I think the most attractive thing is the chip tray in front of the dealer. 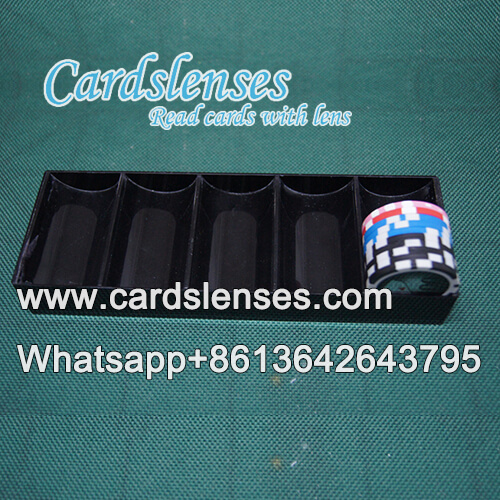 So, to avoid the unnecessary attention from the players, the outward appearance of the plastic black chip tray we choose to process is ordinary. No matter for the function or in the appearance of it, this chip tray barcode poker player is deserved to possess.